Matt Niskanen isn’t the only Mario Kart fan playing in the Stanley Cup. On Monday, we told you about the Capitals d-man playing the popular video game as a way to pass time in the Vegas hotel rooms instead of going out and exploring the many distractions that Sin City has to offer. 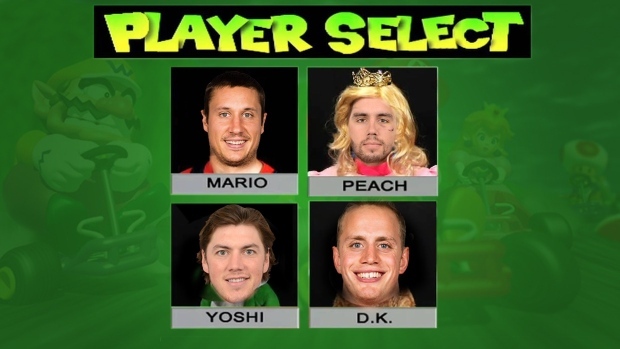 Niskanen tells me he changes up his character for his four hours of Mario Kart, but he always comes back to Princess Peach. “That doesn’t even come close to matching you,” I said. Turns out, the Mario Kart movement was actually started by one of Niskanen’s old teammates, Nate Schmidt during their time in Washington together. In an article written by Isabelle Khurshudyan in the Washington Post, Schmidt and Paul Carey went to a store in downtown Toronto last spring when the Caps faced the Leafs in the first round of the Stanley Cup and brought a N64 for the team to play. “I had more fun watching all of the turmoil and all of the anger,” Schmidt told Khurshudyan. Schmidt carried on the tradition after being claimed in the expansion draft by the Golden Knights, adding another similarity to a series that already has tons of connections. Niskanen and teammate Jay Beagle whip out the console during their down time, which provides a nice change from their structured schedule and helps ease their minds away from the game. "You can’t practice all day, every day,” said Niskanen. “You’ve gotta find something to do with your downtime. It’s funny, too, because I’m not a gamer at all, but I can’t get enough of that." "We do keep it loose, but at the right times, too," Beagle told The Washington Post. "We’re also focused and dialed in, and keeping it loose, it allows you to have fun with it and realize this is a game and this is an opportunity that you only get once in a lifetime." Alex Chiassion was the "most improved player," while T.J. Oshie always plays as T.J. Yoshi. A game built on speed and aggressiveness, just like how the Golden Knights and Capitals teams are assembled. Rumor has it that after the Stanley Cup Final, each team will send their best Mario Kart player to race against each other.